Everyone can join this dinner event who speaks either English or Japanese. This is the first event for our Tokyo Japanese Conversation Group in Protected content . 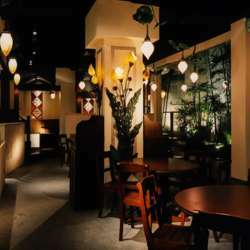 Let's have an exciting dinner time with yummy Asian ethnic dishes, drinks and fantastic folks. #Currently booked as individual dishes menu but we will be able to change a course menu when begining of the event if required. As I must tell the exact number of our group to the staff before the event, please text / call me in advance if you have to cancel / delay this event even in last minutes. I will fix the numbers of attendees on January 29th. I'm looking forward to seeing and talking with you!